With the release of the 2007 vintage this year, The Ruffino Winery is celebrating 80 years of Riserva Ducale dating back to 1927. The history of the winery goes back to 1877 when it was founded by the cousins Ilario and Leopold Ruffino. The winery was sold to the Folonari family in 1913 and it became the first Chianti Classico imported to the United States in the same year. Riserva Ducale is named in honor of the Italian Duke of Aosta who selected Ruffino’s Chianti Stravecchio as his official court wine in the late19th century. Ruffino dedicated the first vintage of Riserva Ducale (the Duke’s Reserve) to honor his patronage. It is interesting to note that it is the only Chianti permitted to bear “riserva” in its proper name. 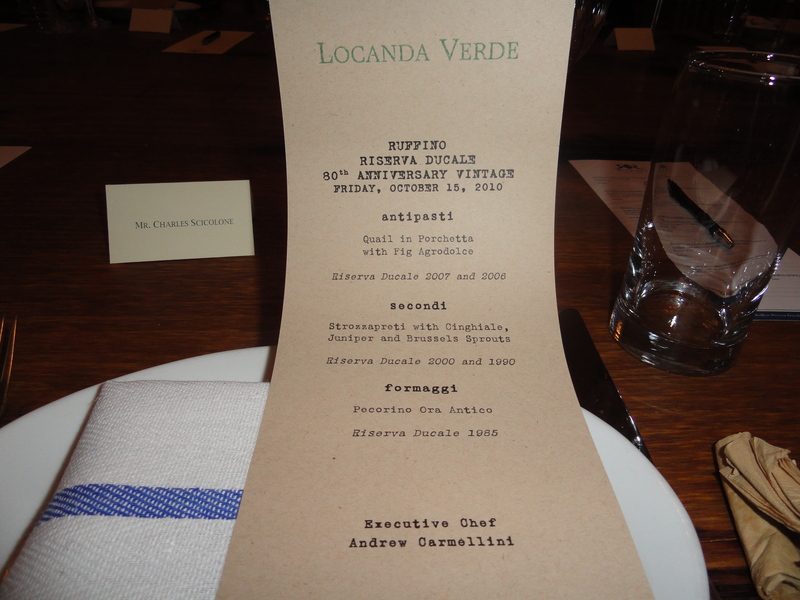 I was invited by Adolfo Folinari to Locanda Verde in NYC to celebrate “Ruffino Riserva Ducale 80th Anniversary Vintage”. Chef Andrew Carmellini, inspired by the occasion produced, an authentic contemporary Tuscan menu . The first dish was quail in Porchetta with Fig Agrodolce. 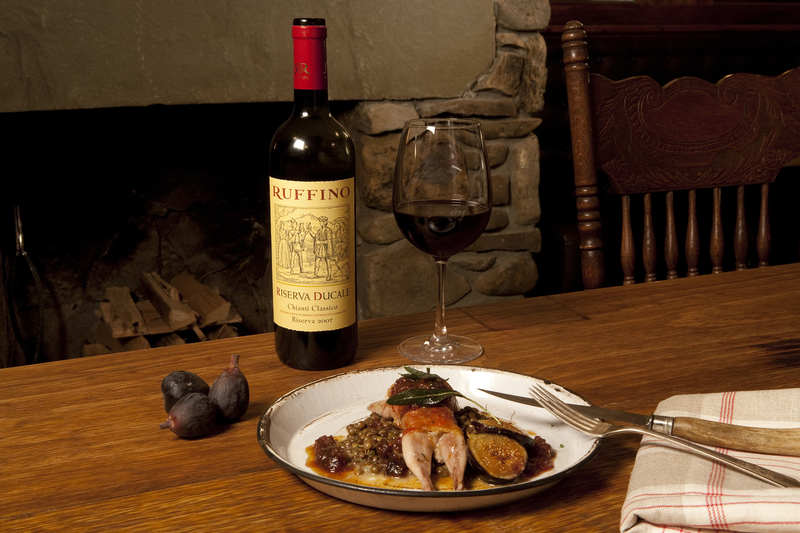 It was paired with the 2007 and 2006 Ruffino Riserva A Ducale Chianti Classico Riserva DOCG. Adolfo said that 2006 was a better vintage than 2007. The 2007 was young and fruity with hints of cherry and spice. The 2006 was more complex and well balanced with good acidity. It had aromas and flavors of red berries and hints of spice and tobacco with a nice finish and aftertaste. Both wines are made from 80% Sanviovese/20% combination of Cabernet Sauvignon and Merlot. These grapes come from the vineyards of Ruffino’s Santedame, Montemasso and Gretole Estates. The soil is typical of the Chianti area, primarily clay with an abundance of galestro rock. The grapes are handpicked in late September – middle of October. Alcoholic fermentation takes place in stainless steel tanks aided by racking and punching down, for about 10 days. The maceration on the skins continues for another 10 days. After completing malolatic fermentation the wine is aged for 24 months, part in 40/80 hl oak barrels and part in stainless steel/concrete vats. It is aged another 3 months in bottle. The next course was Strozzapreti with Cinghiale, Juniper and Brussel Sprouts. This was paired with the Ruffino Riserva Ducale Chianti Classical Riserva 2000 and the Ruffino Riserva Ducale Ora 1990. The grapes for the 2000 are 90% Sangiovese, 10% Colorino, Cabernet Sauvignon and Merlot. Alcoholic fermentation took place for 2 weeks and maceration on the skins continued for another 2 weeks. After completing malolatic fermentation the wine was aged in stainless steel vats for a brief period and then in 40/80 hl oak casks for about 24 months. It then was kept for a period in the bottle before release. The Ruffino Riserva Ducale Oro 1990 (the gold label). 90% Sangiovese, 7% Canaiolo and 3% Malvasia. The grapes are from the Montemasso Estate located near San Polo in Chianti, and the Santedam Estate near Castellina in Chianti and also other selected vineyards. This is hilly land with poor soil of a mixture of clay and sand, rich in limestone and galestro (rocks). The alcoholic fermentation took place in glass painted cemented tanks for 2 weeks, and was followed by a post-fermentative maceration on the skins for another six days. After completing malolatic fermentation the wine was aged for a minimum of 24 months in 80hl Slovenian oak casks and then in stainless steel tanks. The 2000 had mature red fruit aromas and flavors with hints of violets and spice. The 1990 was made without any international grapes and with one white grape. It had the typical hint of violets with mellow red fruit and a touch of spice. It had a very long finish and a great after taste. 20 years old and it was not showing its age! The last course was cheese: Pecorino Ora Antico and the wine : Ruffino Riserva Ducale Oro 1985 made from 90% Sangiovese, 7% Canaiolo and 3%Malvasia (White grape) These grapes came from the Montemasso Estate and other selected vineyards. Aging as above. The 1985 was the wine of the afternoon for me. It reminded me of Tuscany – sunshine on the Tuscan pines was my first impression and it just was everything I wanted in older Chianti. The Riserva Ducale was first produced in 1927. The first release of the Riserva Ducale Oro was in 1947. A few years ago a friend came over for dinner and brought with him a bottle of Riserva Ducale Oro. He wanted us to taste it and guess the vintage. 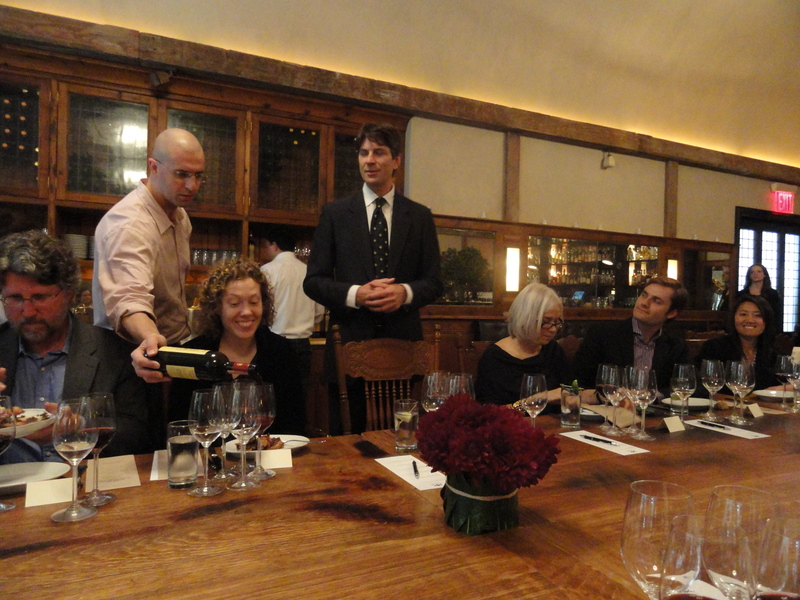 Everyone there was involved with wine and had experience with older Chianti. Someone guessed 1990, another 1982, another 1958 – not because it looked or tasted old but because 1958 was a great year. We were all wrong — the wine was the 1947. Sheldon Wasserman in his classic book “Italy’s Noble Red Wines” 1985 states that the 1947 was made from 70% Sangiovese, 15% Canaiolo,10 % Malvasia and Trebbiano (white grapes),5% Colorino, Ciliegiolo and Cabernet (a first?) and it was made with the governo method. The use of the governo, a secondary fermentation created by the addition of dried grapes 10/15 % or the must of dried or concentrated grapes was traditional in Tuscany. Colorino was usually the grape of choice to be dried. He gave the wine four stars, his highest rating. 57 years old when we drank it! Ruffino makes the longest lasting Chianti Classicos and the 1990 and 1985 were more proof that Chianti can age. I have two bottles of Ruffino Riserva Ducale 1993 Chianti Classico. I’ve kept them well, laid flat, rotated periodically, but in a closet off the kitchen (not in a wine cellar). What is a bottle like this worth? We’re going to try them this weekend. because no one thinks Chianti can age. I have 4 bottles of Ruffino Riserva Ducale 1947, 10 of Ruffino Riserva Ducale 1958, 2 of 1952 and 1 of 1957. They are in excellent condition. I can’t find any quotation on the internet for these early series, how much are they worth?